In addition to Brandon Belt flashing some leather on defense, Sandoval slugging dingerz like the Panda of old, and reports of Mark DeRosa’s death appearing to be greatly exaggerated, one tidbit of “news” has actually appeared, when Bruce Bochy announced an order for the stellar Giants pitching rotation. Timmy remains the Ace, followed by Jonny, Matty, Barry and Maddy. Compared to last year’s rotation, Lincecum stayed as the ace, Zito got a major demotion, Cain stayed steady, Sanchez got a good promotion, and Bumgarner took the 5th starter spot from Todd Wellemeyer’s cold, dead fingers. If this is, indeed, the rotation that Bochy plans to take into the regular season, it raises a few questions. First of all, Matt “The Sheriff” Cain. In 2010, Cain had an amazing year, and by some accounts a better (more consistent, at least) year than Lincecum. Cain has the makings of an Ace, and would be on most other ballclubs, which makes it curious that he would remain in the third role. Present elbow issues aside, he’s Mr. Reliable. He devours innings like some bad 2010 Pablo Sandoval joke – in his 5 full seasons, his 1049.1 IP are the 8th-most in the MLB during that time. In 2010 he lasted fewer than 6 innings only five times; he lasted fewer than 5 innings only twice. He is the picture of stability, working for a 3.00 ERA in August 2010, while the pitching staff as a whole (including Cain) had a 4.55 ERA. He threw over 100 pitches in 21 of his 33 regular-season starts, and he didn’t give up an earned run in the post-season. Plus he has a great head of hair. So, why isn’t he the #2 pitcher? Now that we’ve gotten that out of the way, Andrew Baggarly had some ideas, and a few of them speak to Cain’s strengths, rather than his weaknesses. While the typical Lincecum or Cain start required 3 or fewer innings of relief from the bullpen, Sanchez and Zito are hardly as reliable. Without a doubt, Sanchez’s 2010 season was a dramatic improvement, even though it’s debatable whether the bulk of his spike in numbers came from luck or skill. Still, of his 33 starts, Sanchez went fewer than 6 innings 16 times, and fewer than 5 innings 5 times. As anyone who watched Sanchez last season could tell you, it was just a matter of which Sanchez came out of the dugout: the hard-throwing, bat-avoiding lefty hotshot, or the lost child who couldn’t find the strike zone if his life depended on it. Zito had similar numbers, leaning more toward the colossal, early implosion (13 times <6 innings; 8 times <5 innings in 33 starts), particularly in the end of the year, when he failed to make it out of the fifth inning in 6 of his final 9 starts. It makes sense, then, to space out the super-reliable starters among the coin-flip starters, to avoid two days in a row that require the bullpen to chew up major innings. The other conventional wisdom speaks to the handedness of the pitchers, as a rotation with Lincecum and Cain as 1-2 would give us a righty-righty-lefty-lefty-lefty rotation, which would be… a problem? In general, a righty-righty or lefty-lefty matchup favors the pitcher, while having opposite handedness favors the hitter. Still, a good pitcher is a good pitcher, and people can get a little carried away trying to set up the exact match up that they want. I’ve never really understood why it’s important to break up same-handed starters as much as it is to play the match-up game using your relievers, mid-game, calling on Javier Lopez or Sergio Romo, or one of a handful of excellent clutch relievers. I guess the worry is that we could run into a 3-game series against a team with a bunch of big, righty powerhouses, and we’d throw Sanchez-Zito-MadBum at them, and get destroyed, but I’m just not convinced that it’s a big enough problem. So let’s take a look at just how strong the splits really are for our starters. These are numbers showing the offense that hitters have managed against our pitchers. I’m going to use career numbers here, thanks to Baseball-Reference.com. First of all, Mr. T. L. Lincecum, Esquire. It’s not hard to see why batters fear him so much. Hitters have a measly .222 and .225 AVG against him, and that OPS-against is minuscule. Still, we do see that lefties (LHB) have slightly better numbers (.225/.299/.349) against him, which makes sense. He does have slightly more ownage against righties, as you’d expect, but it’s a pretty minimal difference. He’s got the same thing going on. Lefties have a slightly better slash line (.235/.311/.378) against Cain compared to righties, but they probably still wish they’d stayed at home, rather than face Cain. I mean, 32 points in your OPS isn’t nothing, but it’s far from an exploitable weakness, especially when Cain still makes the average hitter he faces produce on the level of Neifi Perez and his lifetime .672 OPS. Instead of saying that lefties hit better against Cain, we should say that they do slightly less bad than righties. Remember, these are career numbers, so they don’t quite show the dominance that Sanchez pulled out of his leather jacket pocket in 2010 (Sanchez’s career OPS-against ranges 63 points between lefties and righties, that difference was just 1 point in 2010). Still, we see that Sanchez does fare better against lefties, not surprisingly. He had a pretty substantial BAbip difference between righties and lefties, though, which could show that he’s been getting a bit lucky against lefties. Remember, BABip does not indisputably show a person’s luck, but when a player has such a dramatically lower BABip than normal, especially in a certain time period or against a certain group (lefties), it can show that his success may have something do to with some serendipity on his side. Barry Zito is about as even-handed as you can get, with lefties and righties doing almost exactly the same against him. As much as we can, and will, go on about his contract, he’s pretty damn consistent with what he’s throwing out there. While he, like Sanchez, has faced far fewer lefties than righties, it’s hard to see any handedness affecting hitters at all against him. Even his walk rate is almost exactly the same, and the OPS difference is just 15 points. He’s also the oldest and most veterany of the starters, so I think his numbers are more reliable than anyone else due to the large sample size. While the country boy does have some pretty startling splits, with righties eating him up while lefties cower in fear at his mighty footsteps, I chalk this up more to his lack of playing time and small sample size than anything else. So what does that tell us? First of all, there is no massive difference. Lincecum and Cain had minor differences in performance. Even across their careers it barely shows, so across a season, I doubt we’d notice a difference. Sanchez has had a good deal more luck in his career against lefties than righties, but that difference evaporated in 2010. Zito is steadily Zito, for better or for worse, and Bumgarner is, well… new. I can see the bullpen preservation argument in terms of this rotation, and I can even see Sanchez’s promotion as a way to bolster his confidence as a potentially good move, especially when the difference in starts between the #2 and #3 spots is minimal, if existent at all. Still, I don’t buy the handedness thing. If anything, it makes sense just to split up our good pitchers so that we don’t accidentally have a series in which our 3-4-5 gets clobbered by their 1-2-3, but I don’t see that happening too much either. I trust Bruce Bochy to do what’s best for our club, so I’m not particularly worried. It’s too bad to see such a fan-favorite champ like Cain go another year without the national recognition that he might get higher in the rotation, but that’s exactly the kind of thing that I’m sure Cain wouldn’t give a damn about, because he’s just so damned classy. So what do you think? 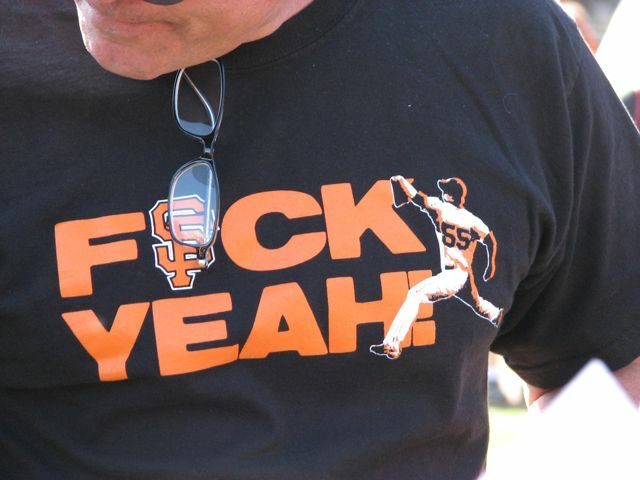 Should we have a Lincecum-Cain rotation? Or, gasp, Cain-Lincecum? Is Bochy on the right track? Should Zito be fifth and Bumgarner fourth, Verducci-be-damned? P.S. I wrote the lede to this piece about a week and a half ago, before I got sick and busy, and I didn’t have time to finish the post until just now. I know that there is more to talk about, Spring-wise, but that’s not the point of this piece, so I just got lazy and decided not to update it. Plus, if you made it all the way down here, you must have thrown the inverted pyramid thing out of the window anyway, huh?